These are exciting times.. again.. There are only a few times in education that have excited me with technology, the first was the launch of the ‘home micro-computer’ in the early 80’s. 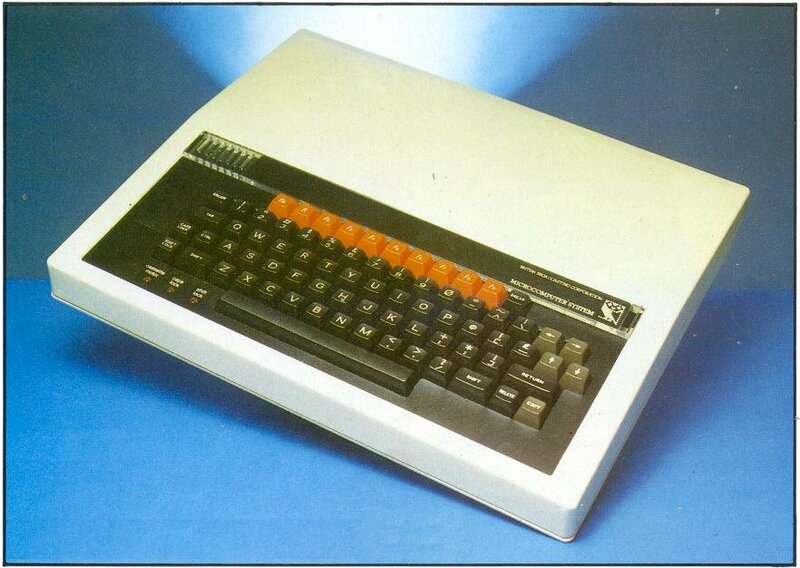 Computers like the Sinclair Spectrum and the BBC Model B had a systematic change on a generation of students with using the technology and programming (as we called it then). Remember when devices like this changed the way we work? However I now believe we are back in those exciting times, which again means the advent and use of the technology in the classroom can really affect a generation and beyond. The power of cloud computing has the means and reach to affect everyone, and believe it has the same potential as those days in the 80’s when home computing took off. Now we all probably use ‘the cloud’ on a daily basis, shopping on Amazon, playing on an Xbox One. However students are now seeing the ability in school to ‘work in the cloud’ using Office 365. Who thought that a student would start a document in an IT suite, save it to OneDrive for Business, and then open it on an IPad when they got home, and not have to reformat it, and then ‘share it’ with the teacher instead of printing – truly transformational times – using key 21st century skills in doing so. We have seen teachers utilise the power of OneNote, the true hidden gem in Microsoft Office. The idea of digital paper in the classroom, and the ability of those teachers to use OneNote Class Notebook Creator to look at student work and give dynamic feedback in the form of audio and video. Again who would have thought that these technologies would be available in the classroom? No more would teachers have to load there car up with textbooks to mark at home, simply by opening the Class Notebook the marking can begin. Indeed who would have thought the big PC only companies like Microsoft, would be offering these technologies on Apple and Android platforms. Visionaries like Satya Nadella and Anthony Salcito are shaping Microsoft into a company that innovates across a complete generation of users. A great example of this is the Microsoft Office 365 Proplus benefit, which means students, and teachers can download (for free) the latest version of Microsoft Office for use at home. Suddenly the playing field is being levelled with the technology, allowing schools to get on with creating innovative teaching and learning both in and out of the classroom. Do I see other companies affecting change like this ? No I do not. So you would think I live in this Utopia world of changing technology in the classroom? Well kind of!. 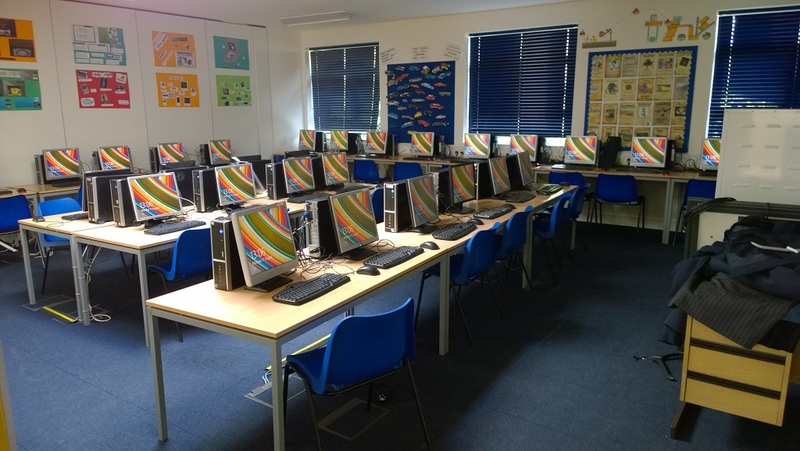 At our school we use the cloud to give our students the best opportunities, however teachers still use desktop PC’s connected to IWB’s and only some students bring there own devices into the classroom. So the final part of this jigsaw really is the hardware, aka the device, aka the tablet. I’ve found that drawing spider diagrams in OneNote on my Surface using the pen has helped me to clearly map out ideas and key terms. Up until now there has only ever been one device on the market which schools have adopted. A truly revolutionary piece of technology and certainly has its place in the technology timeline. Schools today especially primary schools still refer to a tablet as an Ipad, but lets look at how it really fits it into the classroom. A true tablet, has an on screen keyboard, which when in use reduces the screen display (not good for typing that all important essay), or just trying to see the screen. There is no natural typing position on the tablet, so you either lay it flat, or have to buy a carry case with a stand built into it. Also the tablet tends to runs the same mobile operating system, which again has some limitations in day to today use in the classroom. Students should have a device that has the power of a desktop pc, the portability of a laptop and the flexibility of a tablet wrapped in one device. 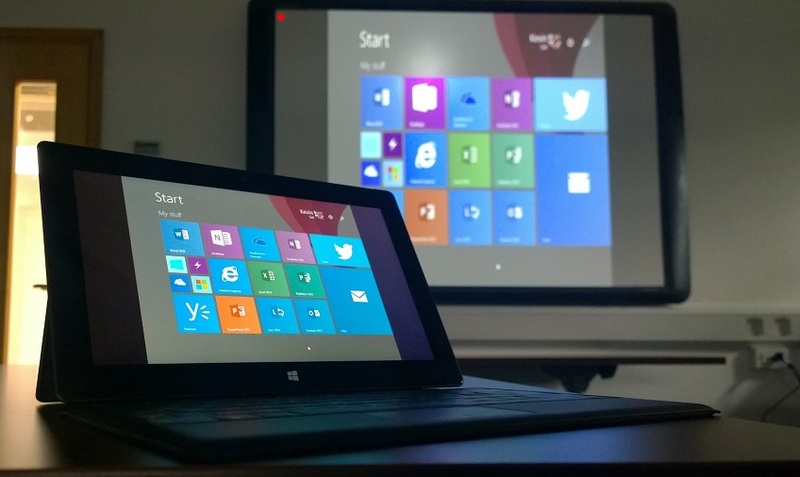 That is why as a school, we have decided to deploy the new Surface 3 from Microsoft in the classroom. We all need a why? in our life don’t we? Why do we do the things we do! 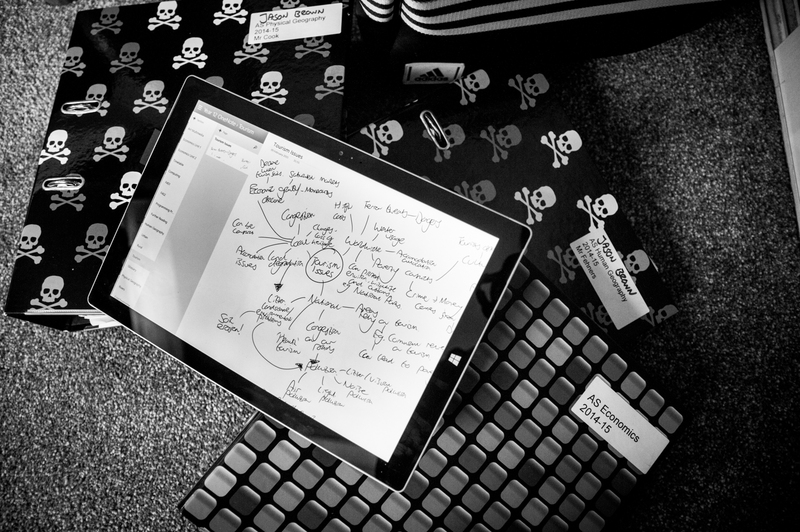 Let me explain the why behind our decision of the Surface 3. 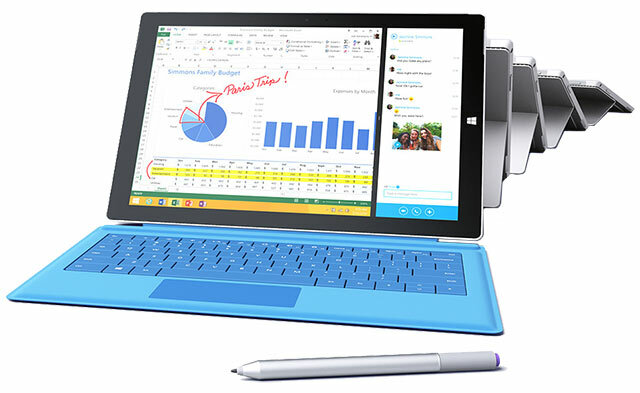 Price – I use a Surface Pro 3 in my day to day work. It has the power of a laptop in the size of a tablet and simply changes the way I work. I can run all of the enterprise software I expect to run, use a full size keyboard and have the added bonus of the Surface Pen with OneNote. However for a school the price point has been simply to high for a mass rollout. School principal Russell Boulton and Vice Principal Jonathan Rockey now use Surface Pro 3 for all aspects of school life, teaching, assemblies, management meetings – Surface is at the heart of it. Looking beyond the tablet – Surface allow you to do so much more in school and out. However Surface 3 addresses this by coming in at a price point which is cheaper than a comparable Ipad. Size – smaller and lighter than the Surface Pro3 we have noticed how students can simply fit the device straight into the school bag. Typing position – Surface 3 has a three position kick stand, ideal for typing in the classroom, or using with the pen to take notes in OneNote. With the positive touch Surface keyboard means Microsoft have learnt from the original type covers which took quite a bit of getting use to. Its Windows 10 ready – Surface is future proof, it doesn’t run a cut down version of Windows (goodbye Windows RT) or a mobile operating system, it runs a full version of Windows. Install whatever software you are running on a PC, Microsoft products, Adobe products, all enterprise grade software which students should have access to. Also Surface 3 is Windows 10 ready, so in the home environment, you gain connectivity through to Xbox One and are able to stream games direct to you Surface. After all its important to have down time as well. 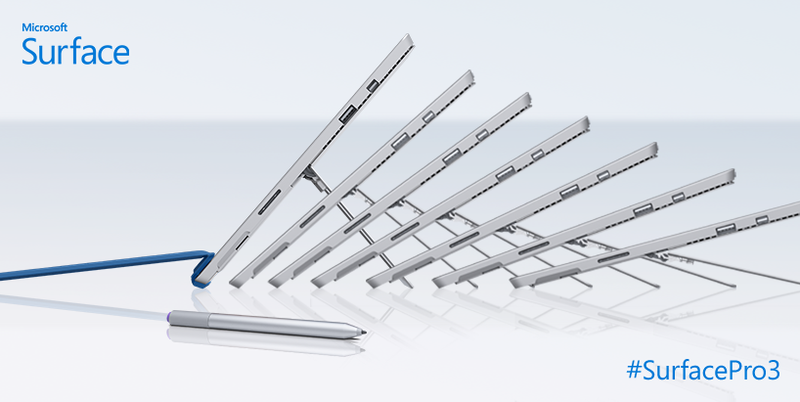 The Surface Pen has been at the heart of many blogs. In education we recognise the importance of the pen in the classroom. It has been proven that the pen is ‘mightier than the keyboard’ in the fact the you will retain more by taking notes with a pen. Your brain will filter then information you need to jot down, rather than typing like for like. The pen also allows you to brainstorm, annotate in no other way. Added to this the superior inking technologies that have been available since the launch of the original Surface Pro, and in Windows 10 you can now annotate a webpages directly and share it through Project Spartan really means it establishes this device in the education arena for a new way of working. Computer or Tablet? like its big brother simply its both, remove the keyboard, its a tablet. Want to type the essay, click, its a computer. Its simply the best of both worlds at an affordable device. So remember Surface 3 is a great device for education, its not the holy grail. Simply go and buy loads of devices for your school does not mean results will improve or attendance will go up (as some companies will have you believe), its a part of the strategy of teaching and learning for your school. Added to services such as Office 365 in the classroom, and preparing students for a world where employers are looking for Microsoft Office skills for there high paid jobs – Surface 3 connects all of this with your students at an affordable price. These are the reasons why Wymondham High Academy, have chosen the Surface 3 in the classroom, this has been done in starting at our end goal of improving teaching and learning in the classroom through technology – our device of choice is the last step. It would be wrong to say our journey will ever end however Surface 3 has just made it a whole lot better for students and teachers. These really are exciting times. How Can Microsoft Technology Help Your Revision? Being an International Microsoft Showcase School and myself being a Worldwide Microsoft Student Ambassador representing Microsoft in Education at Wymondham High Academy, we are always keen to show off how Microsoft products can be used to help students and staff with their educational life, whether that be planning their day, completing their homework, messaging colleagues in school, taking notes in class and most importantly of all at this time of year, revision. 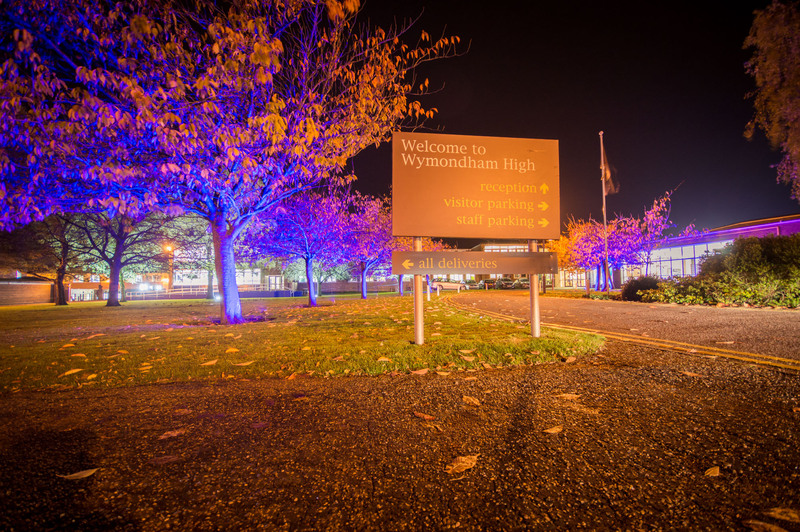 Wymondham High Academy is a Microsoft International Showcase School in Norfolk, UK. For those of you unfamiliar with the UK education system, every child in the UK is required to take GCSE examinations at the end of Year 11 when they are 15 or 16 years old, and those who choose to go onto further education (A levels) also take exams at the end of Year 12 and Year 13. The exams are in May and June, and so April is definitely ‘revision month’ for many teenagers and young adults in the UK! At Wymondham High Academy we have students taking their GCSE and A level exams each year and suggesting methods of revision to these students is absolutely vital to ensure that they do well in their exams. Traditionally revision could be done in a number of ways. A lot of students were encouraged to make ‘flash cards’ with questions and answers on them to help test memory and key points as well as to put posters around their bedrooms with key points and of course make notes from the text books. These methods still work and they are all effective, though I found making notes from textbooks more effective than the other methods. However, with technology come some new methods of revision. 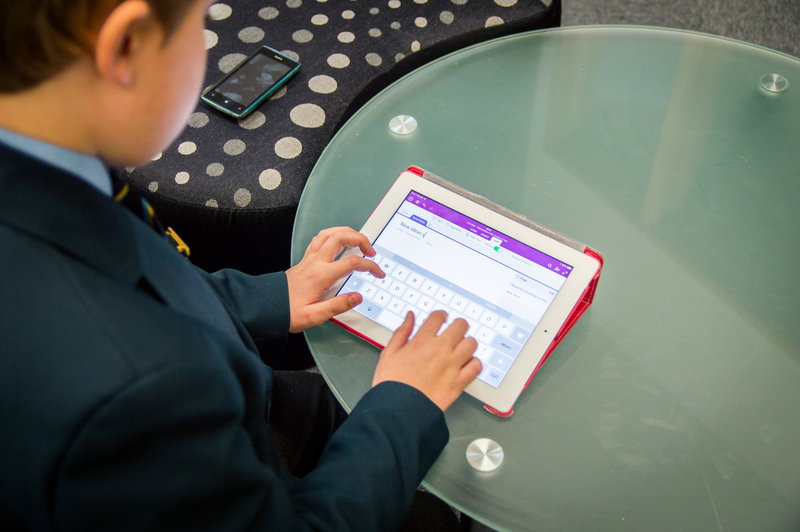 We’ve written a few articles about Microsoft OneNote from both the students’ and the teachers’ perspectives on this blog. Have a read of those articles and it will be clear to see how OneNote can be used to help with revision. Microsoft OneNote stores your notebooks in OneDrive, meaning that you can access them on any device, such as a smartphone (pictured). 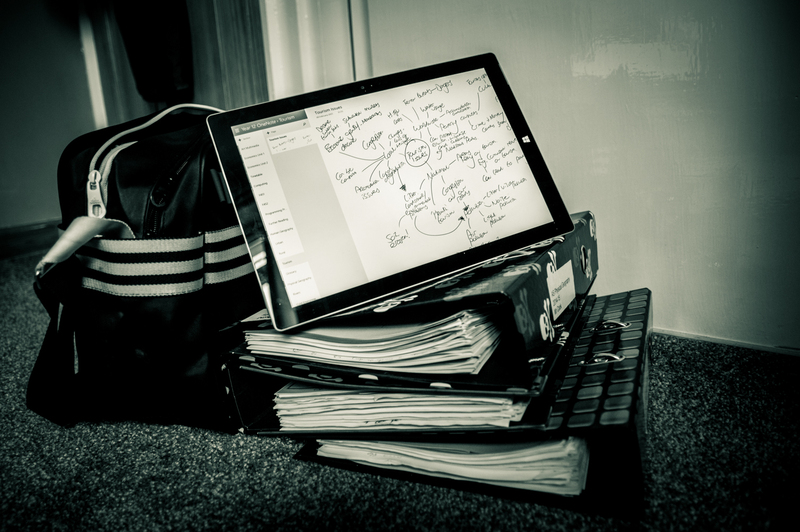 From a students’ perspective, all of your notes are in one centralised place and are accessible on any device. This means that so long as you have an internet connection you’ll be able to access your notes on your laptops, desktop PCs, smartphones and tablets. Even your games console if you want! Having all of your notes in one place means that you can save time trying to find notes and avoid accidentally ‘losing notes’. This means that revision can ‘travel with you’ because you’re not having to taking lots of revision books or files full of paper notes. It’s true that you need periodic breaks from revision to ensure that what you are learning is sinking in and to rest from working, but whilst in the car or sitting there in bed on the night before your chemistry exam wondering what the pH value of rain is, you can quickly pull out your phone and check on your notes on OneNote. You can also periodically test yourself with questions whilst out and about and then check your knowledge using OneNote on your phone or tablet – rather like ‘digital flashcards’. One reason why I think handwriting notes out from the textbook used to work really well for me was because the pattern and the physical action of my writing went into my head and the knowledge was retained. If you are using OneNote on a tablet or a device with a touchscreen you can easily make drawings and handwritten notes. I’ve already written an article explaining how OneNote and a tablet can replace paper as a medium for recording notes and how the Surface Pro tablet is a perfect device for doing this (though that doesn’t mean it is the only device you can use – there are plenty of tablets that OneNote can run on which I’ll get to in a minute!) and the same applies for revision. When I was revising for my mock GCSE exams in November 2013 I was going through notepads and notepads and writing pages and pages of notes. By the end of my revision periods my hands were aching and the ink in my pens was often depleted. However, with OneNote you can an infinite amount of ‘paper’ and not worry about your tablet’s pen or stylus running out of ink and you can still handwrite notes if you really want to. I have found that using OneNote on my Surface Pro is really helpful for geography revision (drawing diagrams) and using the Surface pen and OneNote has introduced me to the idea of using ‘spider diagrams’ for revision to highlight key points. This is especially useful for economics because I can quickly, easily and clearly show how changing one factor (eg inflation) needs to another factor changing (eg price level changing as a result of increased inflation) which in turn changes another factor (reduced consumption, for example, which could then lead to unemployment). Using a pen on a tablet with OneNote makes during diagrams and charts much easier which helps to aid revision. You can of course choose custom colours for ink which is very good for revision because it has been proven that one of the things your memory associates things with colours (sound, smell and imagery are the others) which can help you remember your revision notes. From a teachers’ perspective, OneNote Class Notebook Creator can be a very helpful tool for helping your students with their revision. We have mentioned this fantastic tool several times on this blog, so please take the time to look at this article. 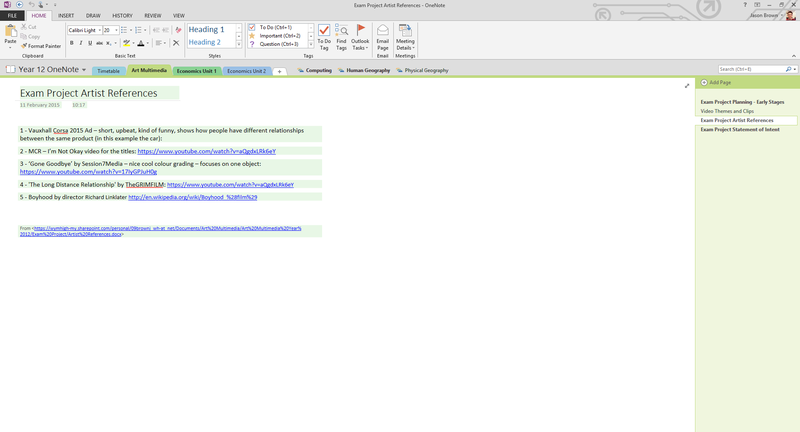 The Content Library section in the Class Notebook is an area where teachers can post links to resources to help with revision (for examples news articles) or post information, for example exam techniques or the subject specification. Students however cannot edit this section of the notebook by default. The Collaboration Space is where resources for revision can be shared between the teacher and all of the students who have access to the notebook. Students can post helpful revision resources for the teacher and other students in the class to look at (and vice versa!) Each student has their own section in the OneNote notebook where they can do their revision. Other students cannot access other students’ sections, but the teacher can. This means that you can check up on who is using OneNote to do their revision and have solid proof that they have been doing revision. Of course, you couldn’t use this to see who hasn’t been doing revision because not everybody is going to want to revise using technology, however it’s a good way to see what your students are actually revising and how they are revising. Using a stylus in OneNote makes marking very easy! You can also use a stylus to ‘draw’ onto documents in Word too. Past papers are a great method of revision. They are the ultimate way of testing your knowledge. However, with 20 pages per paper and wanting to complete as many as papers as possible, printing off past paper upon past paper upon past paper can end up costing a lot of money in paper and ink very quickly. It wouldn’t be so bad if you were to keep the papers or if they served some useful purpose once you had finished your exams, but you end up just throwing them in the bin, or if you’re like me you give them to your Dad to use as mousemats! A year on and he’s still using my old GCSE papers as mousemats! Anyhow, you can download PDFs of the exam papers from the exam board websites and you can also download the markschemes. You can answer the question papers in OneNote and you can also mark them in OneNote using a pen on a tablet if you access to one. If students do their papers in their sections in Class Notebooks then teachers can look at their answers and help to mark their papers and add comments and feedback. Moving on from OneNote, I want to talk about how I revised for my GCSE exams and my AS level mock exams. After having killed my hands after filling notebooks full of revision notes for my GCSE mocks, a friend of mine suggested to me that I typed my notes into PowerPoint presentations instead. Typing the notes into slides on PowerPoint presentations was good because I was limited to how much information I could put on one slide and typing my notes was much faster than handwriting them – and of course no paper was consumed! This worked well and of course using OneDrive and SharePoint you can share PowerPoint presentations and collaborate with people in real-time when making adjustments or revising in groups. Sway makes it easy to create professional presentations for the web and mobile devices. Simply add ‘blocks’ to the presentation and adding content such as pictures is as easy as searching on Bing! 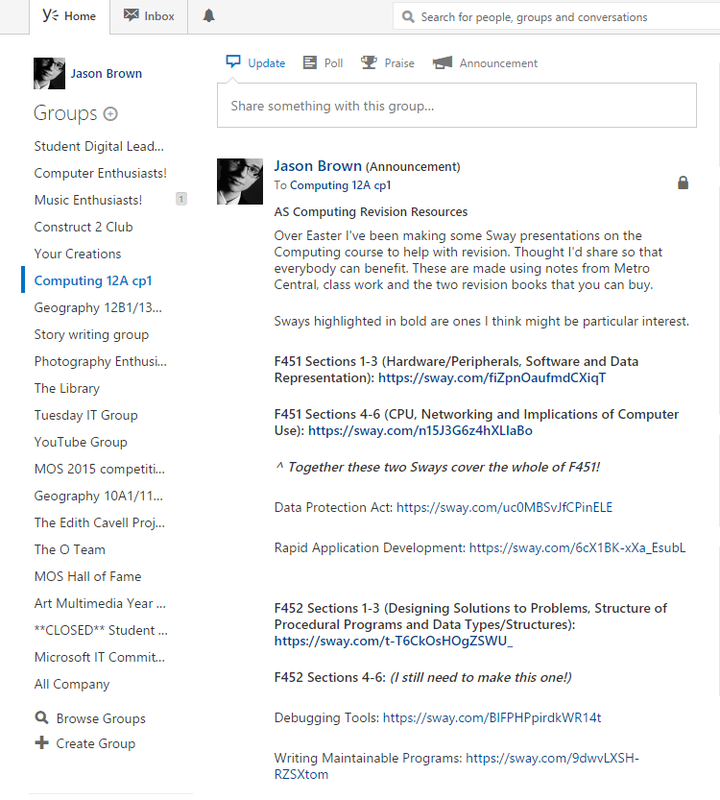 Revision notes made in Sway can easily be shared via something like Yammer by posting the links to your Sways. 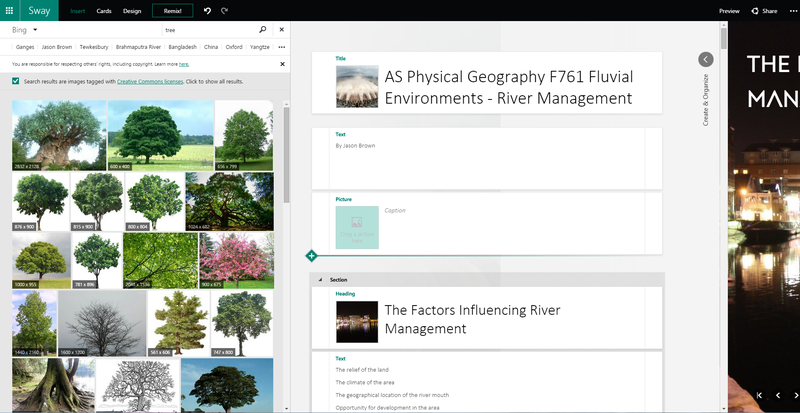 The beauty of Sway is that when I have finished creating one, I can just get a link for the Sway presentation and then post it in a Yammer group or in the Collaboration Space of a OneNote Class Notebook so that the other people in my class can benefit from my notes. To get started with Sway all you need to do is visit sway.com and sign up, and that’s it! Get Swaying! Of course, Sway is a great alternative to PowerPoint and can also be used to deliver engaging and interactive presentations. I use it a lot to present ideas and meeting presentations to my Student Digital Leader Team. Here’s what one teacher had to say about how he thought my Sway presentations looked in comparison to his lesson PowerPoints. OneNote and Office 365 is accesible on just about any device. It is pictured here running on an iPad. The best thing about using Microsoft technology to help you revise is that it is all free. OneNote is now free to download and comes pre-installed on every computer with Windows 8 anyway and Sway is a free tool that you can use. Staff and students at Wymondham High Academy are also entitled to download 5 copies of the latest Microsoft Office 365 software at school so that they can have the same version of Office at home as they do at school which makes the transition between the two seamless. Whilst I am definitely a fan of running Windows and Microsoft software on Microsoft hardware, not everybody is, and that’s fine because Office 365 and OneNote can be downloaded and installed on any Windows, iOS or Android device meaning it runs on a huge variety of hardware ranging from a £100 Windows 8.1 tablet to a £1200 Surface Pro 3 to a £400 iPad or to a £200 Google Nexus. This makes working very flexible and you can the use the platform that best suits you. To conclude, revision isn’t all about handwriting notes. You can now make something that is eye-catching, informative, helpful, very accessible and easy to share with peers thanks to Microsoft technology. I wish everybody who is taking exams this year the very bust of luck! Hopefully this has been a helpful article! The O Team also has a YouTube Channel with several Office 365 tutorial videos for students at Wymondham High Academy. I wrote an article today explaining why the Surface Pro is the ‘most perfect’ device ever made, which you can read here, but as I was writing it I found myself talking a lot about the pen and OneNote and how it made taking notes easy. So I thought I’d write another article explaining why Microsoft OneNote is the perfect piece of software for education! Firstly, it’s free! You can read all about that here. With students more often than not being unable to afford the latest software all of the time (especially having spent a chunk of money on a tablet like a Surface Pro 3), OneNote being completely free is a blessing for any student! Of course, Office 365 Pro Plus Benefit enables students and staff in educational institutions to have access to five free copies of the latest Microsoft Office software and as a student you’d be stupid not to take advantage of that great offering, but many schools and students do not know about this offering. OneNote is part of the Microsoft Office 2013 suite and is included in all editions of the suite as well as Office 365. 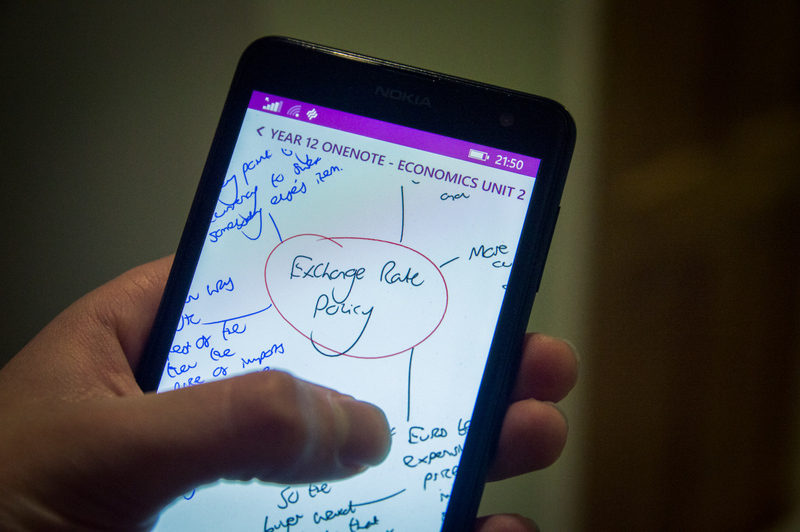 Note-taking with a pen and OneNote is easy in any scenario – whether it be in the classroom or in the meeting room! Secondly, OneNote makes all of your notes accessible on any device. We know that students have a variety of devices that they like to use – varying from laptops, desktops, tablets and smartphones. I’m a student myself and I have all four. OneNote apps can be downloaded on Windows, Mac OS X, iOS, Android and Windows Phone meaning that it doesn’t matter what device you want to use for note-taking, the chances are OneNote can be used on it. The Metro app for Windows 8.1 is particularly nice and ideal if you want to write using a pen (pictured left). You can save your OneNote notebooks locally on your device but you are much better off saving them into the cloud because then it is much easier to access them on any device and when you make changes on one device the changes are automatically synchronised (‘applied’) to your other devices so you can work on a tablet one minute and on a desktop computer the next and then a phone without worrying about needing to manually transfer and update your notebook. By default your notebooks are stored on OneDrive. This makes OneNote a very versatile app. OneNote is accesible on just about any device. It is pictured here running on an iPad. But the big reason why OneNote is a student’s dream is because it eliminates the need to create massive paper files and saves you having to carry these heavy, heavy files to school. Paper files are a student’s nightmare. As a student I can tell you that there is nothing worse than having to cart around these huge files to school. The files are heavy and have caused me some serious backache over the past few months and because they don’t fit in my bag properly, I end up having to carry them in a separate bag to school. Paper files have cost me a lot of money in paper, ink and rucksacks. My previous £40 rucksack split thanks to carrying these massive files to school. Paper files often do not fit very well into bags. They are unpractical to carry. 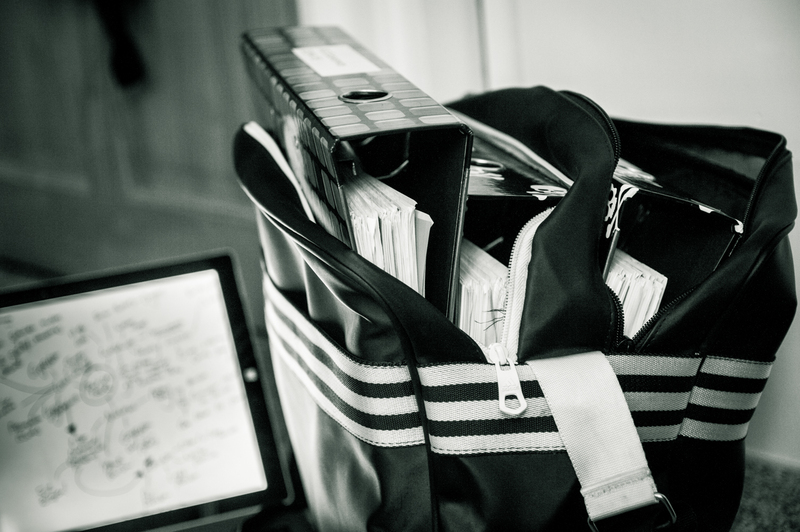 However, one tablet with OneNote fits very nicely into any bag! Paper files are also a pain to revise from – especially if you only need to revise half of what is in the file. More often than not you’ll need to take out sheets of paper in your file to revise from and you risk putting them back in the order, or worse, the whole file will pop open as try to turn over 100 sheets of paper and suddenly you’ll find all of your work all over the bedroom floor. Then you have to spend time putting the file back together when you could be revising. OneNote can replace all of the paper in these files. Put simply, to most students files are a nightmare. One has to wonder why, when we live in a world of scarce resources, we are still printing out work and consuming masses and masses of paper and using hundreds of pounds of toner to produce an archive of work that is hard to organise, takes up a lot of physical space, is hard and impractical to transport and difficult to revise from. We do not like using our natural resources to produce electricity, heat homes or manufacture goods. We are always being told that renewable energy is the way forwards and we are constantly being pestered to save paper and ‘think green’ and recycle just about anything we can. We are always being told about the damage that logging does to the rainforests and the environment and how we can help by buying sections of rainforest to protect to stop this. So why are we still encouraged at school to print out work and put it in a massive file when we know that this is not sustainable? It seems to me like it’s just an old idea that has stuck around and has become the ‘accepted’ way of doing work at school, or we have yet to find a way in which technology can replace huge files. This is where Microsoft OneNote comes in. A lot of people ask me ‘what is OneNote?’ and the easiest way to describe it is ‘a digital file’. Literally. Open up OneNote and what do you notice? Little tabbed sections at the top of the window and a Pages panel on the right side of the window. The little tabbed sections represent subject dividers in a paper file and the pages represent – you guessed it, the pages of the file. The tabbed interface of OneNote makes organising notes straightforward. This makes organising your notes very easy and you can set your notebook up in such a way that makes finding notes easy for you. This is of course great for revision ad you don’t need to worry about your notes falling out place – and if they do get disorganised for whatever reason, you just drag the pages and sections into the order you want. 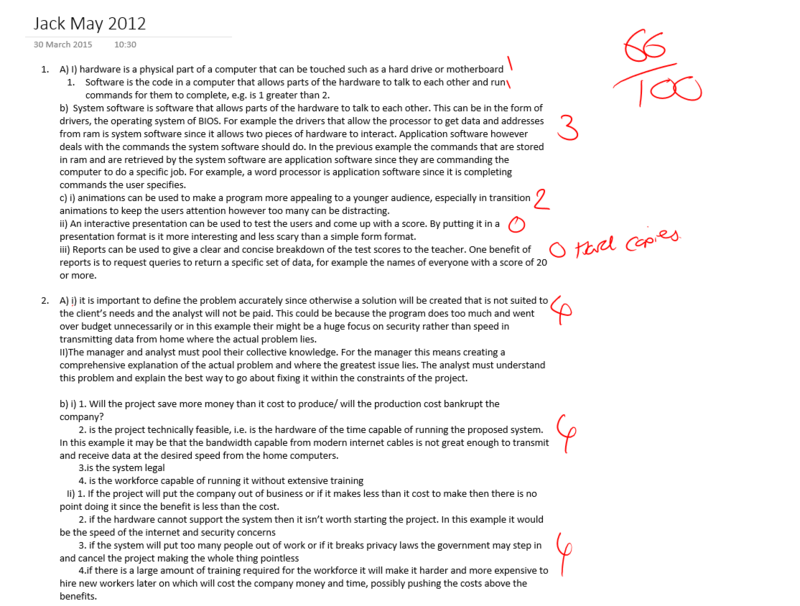 OneNote is much better than Word for doing your work in. Not only does OneNote support things like handwriting, it is much better for organising notes because your work is stored in one ‘document’, and not several individual Word documents. The great thing about the tabbed interface of OneNote is that you can arrange your notebook into your subjects (for example) and this means that OneNote can quite literally replace an unlimited number of heavy, bulky paper files. OneNote means that one small and light device can replace multiple heavy folders. But OneNote is more than a digital file. You can share and collaborate on notebooks using OneDrive and the handwriting recognition in OneNote is now so advanced that you can select handwritten notes and turn them all into typed notes. What’s more, it also converts special symbols such as maths symbols into typed characters. Why is this good? Isn’t it just a gimmick? One might argue that, but think of it like this. Everything in OneNote is designed to make your note-taking faster and easier. Most people can write faster than they can type – but most people’s handwriting is poor. Now what we can do is write quickly using a pen on a tablet, and then we can transform scrawly handwritten notes into beautifully-presented typed up text. This makes note-taking quick but note-revision straightforward and simple. You can use the Office Lens app on your smartphone to take photos of diagrams and text in textbooks and then you can send these photos directly to OneNote and it will automatically crop, straighten and align the images and then put them into the page you specified in your notebook. This makes taking notes out of the textbook very quick and easy! OneNote Class Notebook Creator is a great tool for teachers. OneNote not only saves students the pain of carrying files to school, but it also saves teachers the pain of carrying them home to mark! OneNote Class Notebook Creator is what it says on the tin – a OneNote notebook that a class can share and work in. There is a Collaboration Space where everybody can share ideas, but each student has their own little private section to work in which only them and the teacher can see. This is fantastic for teachers and is the digital equivalent of a student handing in work to a teacher to mark. Watch the video below to learn how easy it is set up OneNote Class Notebook Creator! The features of OneNote go on and on, but there are clear environmental and efficiency benefits to using OneNote in the classroom. OneNote saves paper, ink, time and money and makes working with technology much easier and quicker. With it being Valentine’s Day and all, I’d thought I’d share my new-found love with the Surface Pro and explain why I think it is simply the ‘most perfect’ device ever made. 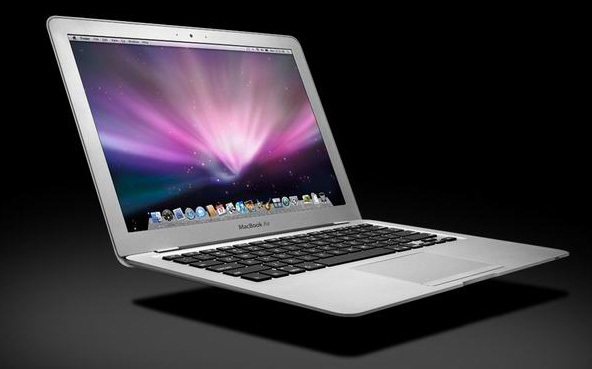 The original MacBook Air of 2008 is generally said to be the ultrabook that started the trend for slim and portable laptops. 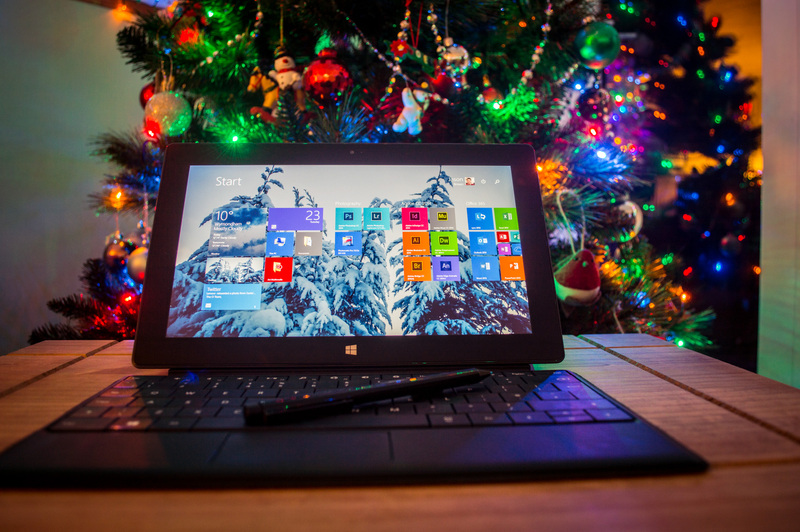 What do consumers look for in a laptop or portable computer in 2015? Portability, long battery life and power are definitely three things that consumers want for computing on the go. Since the MacBook Air first came out in 2008 revolutionising the concept that having a stylish, portable computer with a great battery life was possible, everybody’s been onto it. Over the years the shortcomings of those early utlrabooks such as the first generation Air and early attempts by HP, Lenovo and Dell have been ironed out, but truth be told: ultrabooks are becoming a thing of the past. Put simply, they’re a little stale. Whilst having a slim computer with decent specs and good battery life was great in 2008, the world has moved on since then. There is a new ‘ultrabook’ on the market now – and has been on the market for several years. And I’m using one to type this very article up on. I give you: the convertible tablet (sometimes called a ‘hybrid’). Why are hybrids becoming the ‘new ultrabooks’ then? It’s simple really. Where an ultrabook offers great portability, good battery life and usually a high resolution display, they do have their limitations. Whilst many of them come with touchscreens these days, where is the pen? What happens if you want to save even more weight by detaching the keyboard or want to walk around with your device and use it as a tablet? You just can’t do it with an ultrabook – so is an ultrabook really as portable as the manufacturers make them out to be? There are a great deal of hybrid devices on the market these days with Microsoft, Lenovo, Dell, ASUS and Acer all offering their products, so the choice is not limited, but the ones I have been most impressed by are Microsoft’s Surface Pro devices. The Surface Pro I have runs Adobe CC 2014 near enough perfectly and is small and light. Perfect mobility! I’ve owned an original Surface Pro for a few months now and from the very moment I first turned it on I could see how for school it was going to be much better than my ThinkPad L540 – you can already ready my article about the Surface Pro in education here if you are interested. I still feel that the original Surface Pro was one of the most pioneering devices ever made because it was the tablet that started the trend for hybrid tablets. Simply put, the Surface Pro was, and still is, a tablet that can replace your tablet. It had an i5 3317U CPU which was more than enough grunt under the ‘hood’ and paired with 4GB of RAM and an SSD of 64GB or 128GB, it ran, and still runs, just about anything perfectly. The 1080p display is one of the best I’ve seen and is crystal clear. I want to talk about the pen, but I’ll do that later because I think that is the biggest selling point of the Surface Pro and is the secret behind what makes it the most perfect device ever made. If you ask me, the Surface Pro was, and still is, quite simply nearly perfect. There are only few ways in which I feel it could be improved and Microsoft listened to their customers and fixed these in the Pro 2 and Pro 3. For a first generation device, the Surface Pro absolutely nailed it and I love mine. Of course, the Pro 2 came out with a newer CPU, the option to have 8GB of RAM, the option for 256GB and 512GB models and a three-position kickstand which was great. I have never used a Pro 2 but secretly I wish I had bought one instead of my Lenovo for school, but I have a Pro now which is a very similar device. 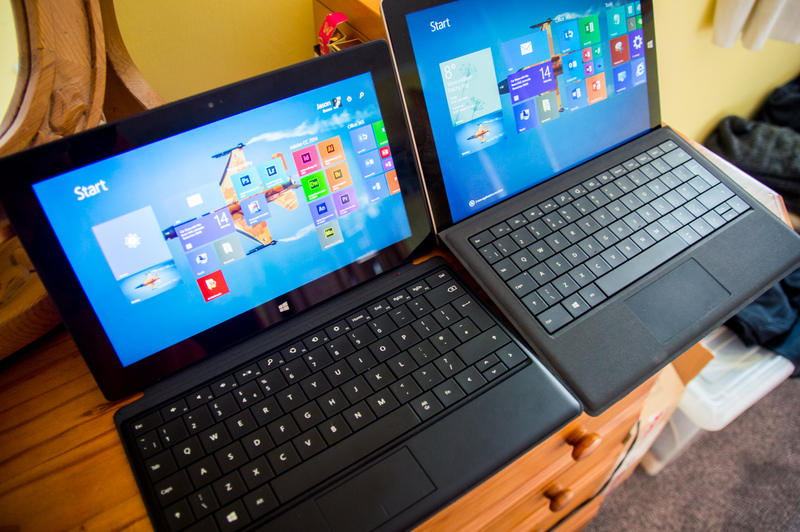 The 12″ Surface Pro 3 is noticeably bigger than its 10.6″ predecessors but is not really any heavier. The Pro 3 has been the ‘new kid on the block’ since July 2014 and what can say other than ‘this is the most perfect device ever made’? It genuinely is. Of course I’m no stranger to the Pro 3, I’ve played with a few and I see them around school everyday because several (lucky!) people I know own them, but this is the first time I’ve had on ‘review’ to test for any length of time – and let’s say I am absolutely smitten. Truth be told, I actually have this Surface Pro 3 on ‘review’ because apparently there is a problem with the screen where it would flicker occasionally. It actually belongs to my headteacher, Russell Boulton. Since completely removing and reinstalling the latest Intel HD 4400 graphics drivers, I think I have fixed it but I might just lie and say it’s broken and offer to put it in the bin so that I can keep it and get myself a free copy of the most drop-dead gorgeous tablet ever made. 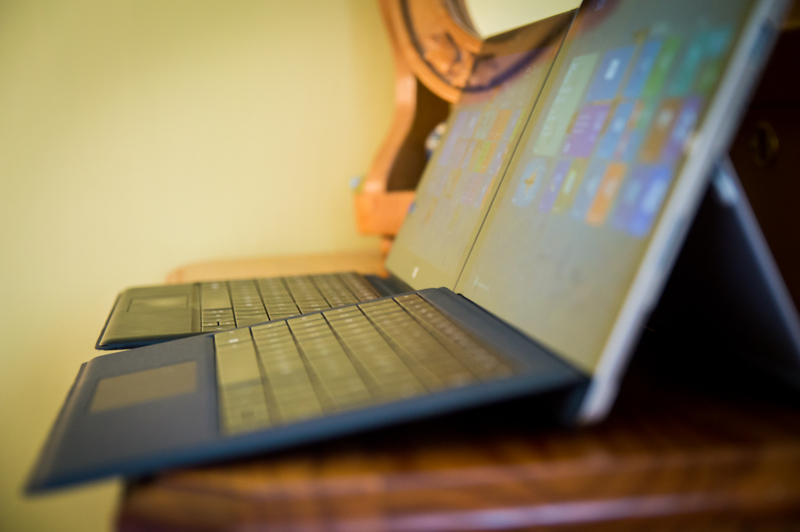 So let’s get to it – why is the Surface Pro 3 the ‘most perfect’ device ever made? 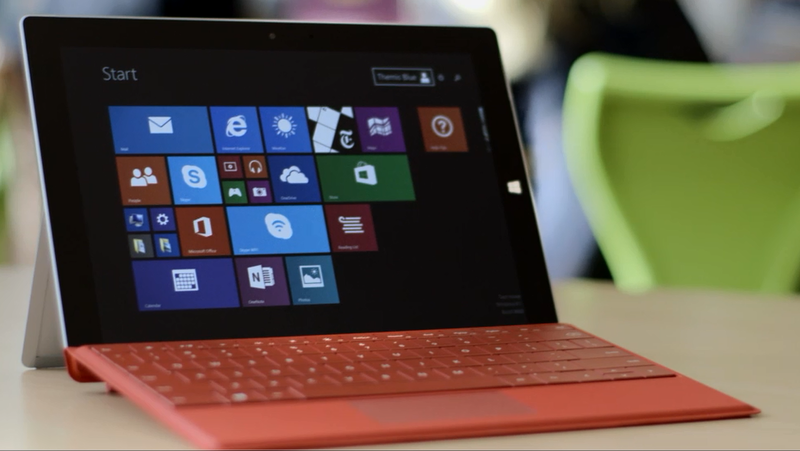 The Surface Pro 3 is well and truly the tablet that can replace your laptop – and your desktop! Microsoft continue to market the Pro 3 as ‘the tablet that can replace with your laptop’. Usually with marketing claims like this you have to take them with a pinch of salt and either laugh and say ‘in your dreams!’ or move on. But Microsoft have truly hit the nail on the head with this claim. The 12″ 2160×1440 display is every bit as gorgeous as the displays you get on the Lenovo ThinkPad X1 Carbon and the new Dell XPS 13 (if a little lower resolution) but the Surface Pro 3 has the benefit of coming with a touchscreen as standard and whilst that high resolution on a 12″ display makes for fantastic real-estate meaning that you get the best of both worlds: a stunning display and a small(ish) display which is still perfectly usable. The original Surface Pro and the Pro 2 being around 10″ maybe make for better tablets but they don’t have as much real-estate as the Pro 3 does so I feel that they aren’t quite as good laptop replacements. The Pro 3 seems to be good blend between a laptop and a tablet. Most premium ultrabooks are 13″ or 14″ but the Pro 3 being around 12″ is more portable and to be honest you don’t need the extra space with the high resolution display. 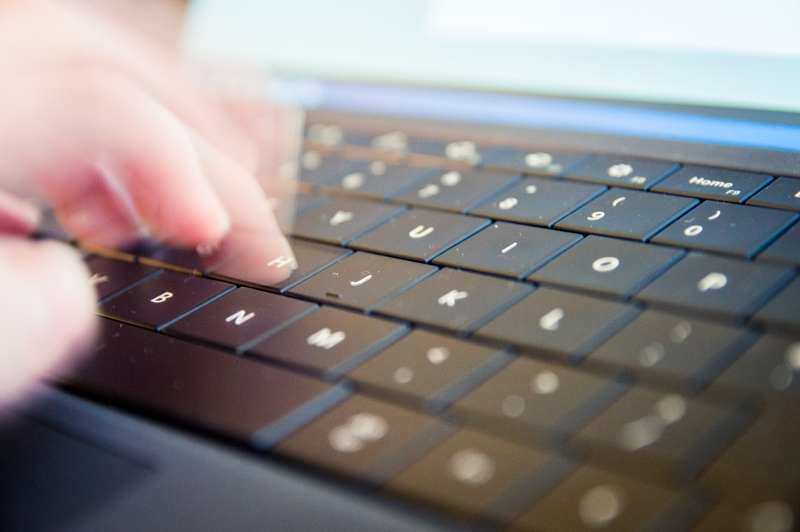 The keyboard on the Surface Pro 3 is not bad but doesn’t quite stack up to a keyboard on a proper laptop. Whilst I am not going to lie and say that the keyboard on a Surface Pro 3 can match the world-class keyboards on Lenovo’s ThinkPads and is even really as good as the keyboards on most laptops, it’s not bad and must be half-decent because I’ve managed to write a 2,000+ word article on it! But where the Surface Pro 3’s keyboard shines over the other ultrabook’s is that it can be detached and voila you have yourself a tablet! This makes the Pro 3 an extremely portable and versatile device. Try doing that with a ThinkPad X1 Carbon. Lovely as the X1 is, it’s not as versatile as the Pro 3. But if I am perfectly honest I prefer the keyboard my Surface Pro has (the keys seem to have more travel). The Surface Pro has always represented being a perfect blend between power and portability. Two years after the original Pro came out, its i5 and 4GB of RAM are still perfectly adequate. The Pro 3 improves on the Pro and Pro 2 by offering a choice of SKUs to choose from. Let’s face it – even the ‘low-end’ i3 model is more powerful than the CPU in an iPad and is perfectly adequate. You can choose from i3, i5 and i7 offerings with the choice of a 64GB, 128GB, 256GB or 512GB SSD. There is a Pro 3 to fit everybody’s needs and budget. Perfect, eh? Let’s now talk about the pen. It’s funny how times change, isn’t it? In the early 1990s, pen computing was seen as being the future. It merely died away for computing and was only seen as being useful for PDAs and early smartphones and ‘Pocket PCs’. In 2007 Apple launched the first iPhone and its biggest selling point was that you didn’t need to use a stylus. Steve Jobs famously said that if a company made a tablet that needed a stylus, they’d ‘blown it’. In 2015 the situation has changed. A touchscreen tablet without a pen is like a dog without a bone. Even Apple have been forced to admit this which is why the 12″ ‘iPad Pro’ will come with a pen (seem familiar?). 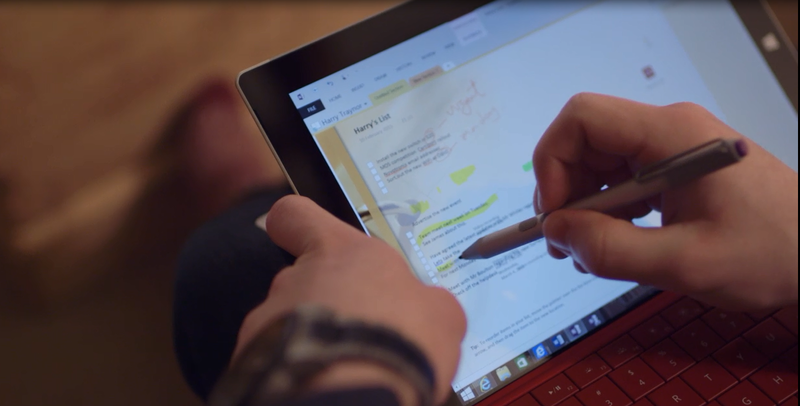 The pen has always really been the selling point of the Surface Pro. 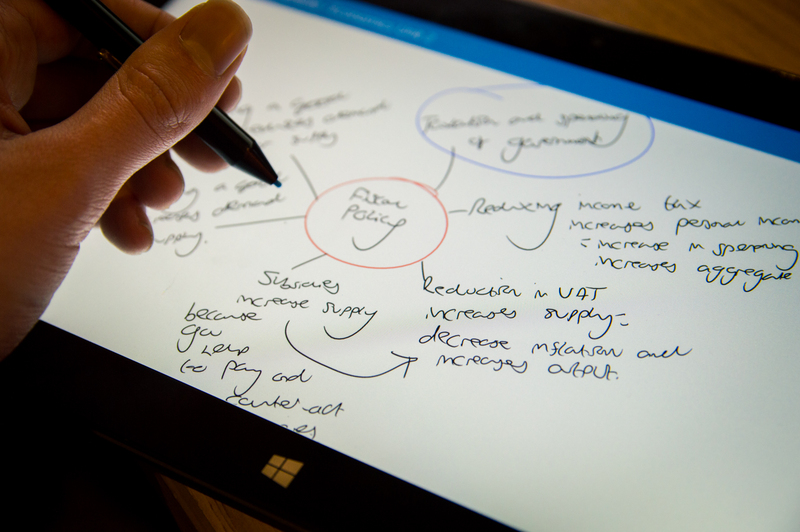 With apps like Microsoft OneNote in this day and age, it makes sense to use a tablet with a pen – the pen makes note taking so much easier and with handwriting recognition as advanced as it is in OneNote on a Surface Pro, we could be spelling the end of the keyboard (no pun intended, honestly). You can read my article about why OneNote is ‘perfect for education’ here. 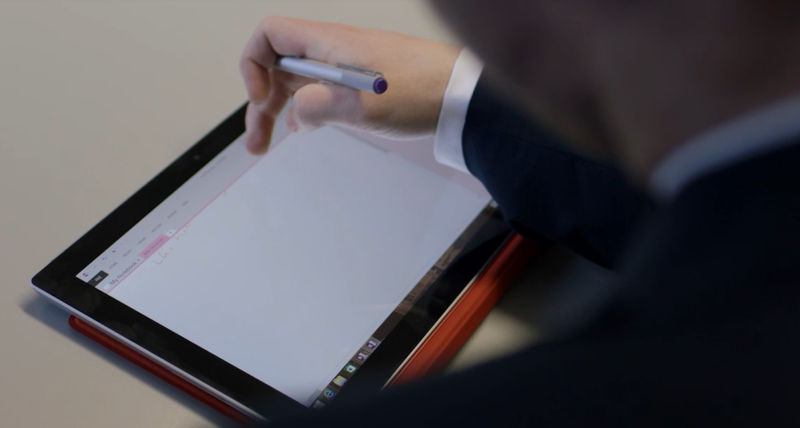 The pen on the Surface Pro is a multi-purpose device and the versatile kickstand makes using the pen easy. It must be understood that the pen is a multi-purpose device. 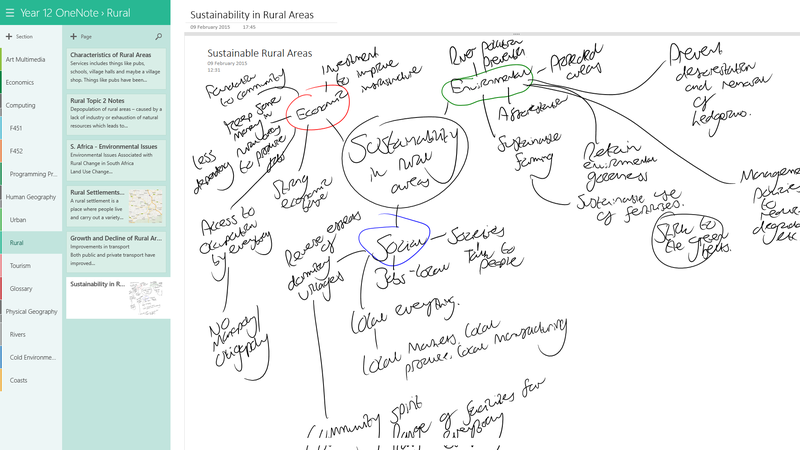 Not only is it ideal for note taking and drawing diagrams in OneNote, it is also fantastic for creative applications. 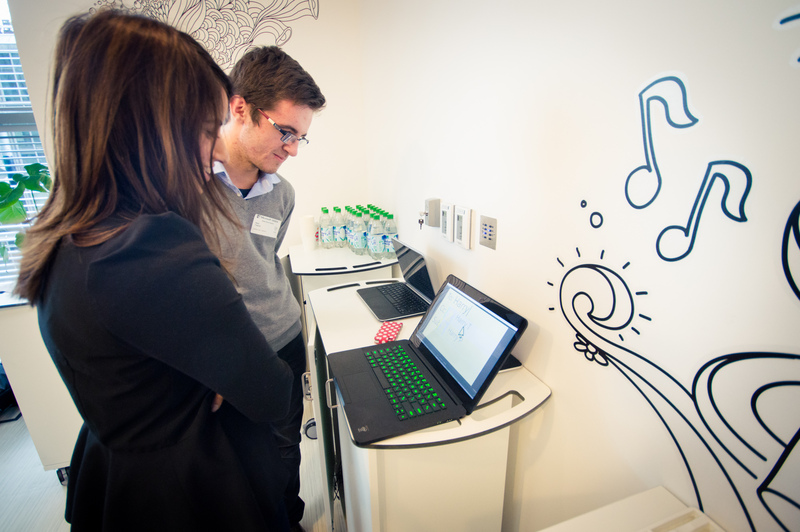 Adobe CC 2014 is designed to work with the Surface Pro and notably make use of pen technology. Designers and creatives love working on their tablets with pens. Who needs a graphics tablet a desktop PC in 2015 when you can just use a Surface Pro which is two in one and portable? One problem with the original Pro was that its kickstand only had one position. This position was fine for general computing but if you want to use the pen you need to use the tablet flat on a desk (ideally). This works fine but the Pro 2 and particularly the Pro 3 offer much more versatile kickstands that support a variety of positions making it easier to use the pen whilst the Surface is not flat on a desk. People are worried that one day people won’t be able to hold a pen because nobody handwrites these days. That’s not true at all and we are in a time and a place where we are seeing the rise of pen computing once again. More and more people are seeing how a pen is useful for computing and applying it to many applications. It will be a long time yet before humans forget how to hold pens, I feel. 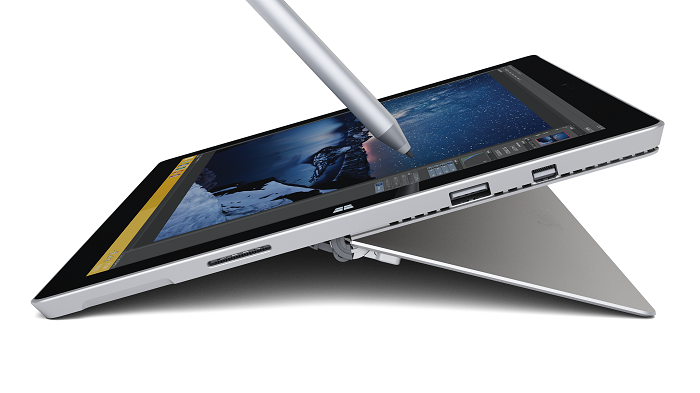 No matter how you prefer working, the Surface Pro 3 can accommodate it. As I said earlier, many ultrabooks come with beautiful touchscreen displays that are high resolution and they are lovely. But I struggle to see why you’d want a touchscreen on what is essentially still a laptop unless it comes with a pen. You want to take your laptop to school or work to take notes – you are still forced to type. You want to draw a diagram in your notes? You can’t quickly draw one. You want to use a pen to draw something in an Adobe app but you are stuck with using the mouse or getting a graphics tablet. The pen is a truly overlooked piece of hardware. Still not convinced that the Surface Pro is the most perfect device? If there’s one more thing that needs to convince you is the price. I admit, when the original Surface Pro came out in 2013 I said ‘£700 for a tablet? Are Microsoft being serious?’ but that was before I realised that the Surface Pro was literally a fully-blown PC in a tablet shell. Unfortunately, many people thought like I did and still try and compare the price tag of the Surface Pro 3 to other tablets such as the Nexus line and the iPad. But you shouldn’t compare the Surface’s price tag to the price tag of the other mainstream tablets because the Surface Pro has always been much closer to a high-end laptop or ultrabook than it has been an ‘mainstream tablet’. 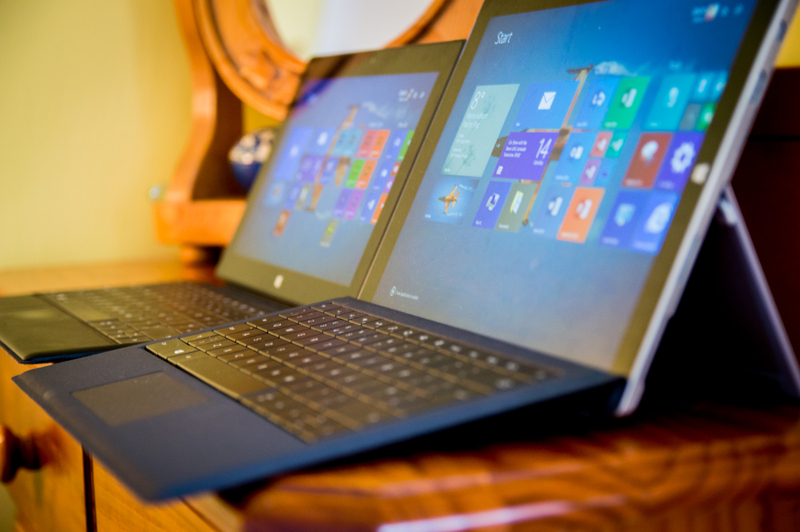 The Surface Pro 3 is likely thinner than the X1 and the XPS 13. 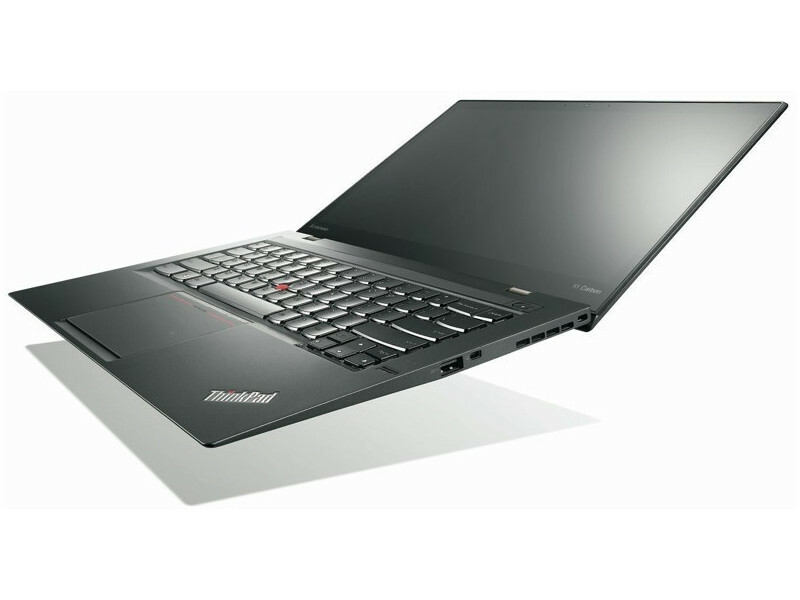 For £1,200 you can have an entry-level Lenovo ThinkPad X1 Carbon – Lenovo’s premium ultrabook offering. It’s in its third generation now (just like the Surface Pro) and for your hard-earned cash you will get an i5-5200U, Windows 8.1 x64 (non-Pro), a 14″ 1920×1080 TN display (non-touch), 4GB of RAM and a 128GB SSD. For £1,050 you can have a mid-range Surface Pro 3 with an i5-4300U, Windows 8.1 Pro x64, the 12″ 2160×1440 multi-touch display with the Surface Pen that all Surface Pro 3s have, 8GB of RAM and a 256GB SSD with all of the benefits listed above. Add £90 on for the keyboard and the Surface Pro 3 is still a better deal than the X1 Carbon. You have to spend more than £1,500 before you even get a touchscreen on the X1 Carbon – and even then you are still stuck with an i5, 4GB of RAM, a 128GB SSD and Windows 8.1 x64 (non-Pro). Lenovo’s X1 Carbon is a gorgeous notebook, it must be said, but the value just isn’t there when compared to the Surface Pro 3. For £1,550 you can get a Pro 3 with an i7 and a 512GB SSD. Add £90 for the keyboard and this becomes £1,640. Let’s just say that the equivalent X1 Carbon doesn’t exist because Lenovo doesn’t offer a model with a 512GB SSD, but they will charge £1,930 for a model with an i7-5500U, Windows 8.1 Pro x64, a 24560×1440 touchscreen , 8GB of RAM and a 256GB SSD. For £1,050 you can also have an entry-level Dell XPS 13 – Dell’s new premium ultrabook offering. You’ll get a 5th generation i5 CPU, Windows 8.1 x64, 8GB of RAM, a 256GB SSD and a QHD+ touch screen display. Granted, the resolution is slightly higher on the Dell than the Surface Pro, but what are you missing in the way of versatility by sticking with an ultrabook? What we can conclude from this is that people who compare the Pro 3’s pricing to other tablets are misguided. The Surface Pro 3 is actually a very competitively-priced machine and clearly outshines its competitors in the price war. The cheapest Pro 3 starts at £640 and this has an i3, 4GB of RAM and a 64GB SSD which isn’t too bad but it could be argued it is pricey for what you get. The value starts to shine when you get to the i5 offerings. Don’t even get me started on Apple, but they do appear to be better-priced than Lenovo in this market at least. Don’t get me wrong, the X1 Carbon is a gorgeous laptop, but it is clearly not as much value for money as the Surface Pro 3. Persistent perfection: the Surface Pros are beautiful tablets. Just look at the Surface Pro tablets. They are all drop-dead gorgeous. I am so bored on the ‘Apple look’ these days that the relatively rectangular look of the Surfaces looks beautiful to me. There is no denying that all of the Surfaces are beautiful tablets and are well-built and turn heads. So there we go, these are the reasons why the Surface Pro is the ‘most perfect’ device ever made. Why do I love going to school? Every now and then I get to bring home very nice pieces of technology like this to try out! Ultrabooks are not the future. They just aren’t versatile enough to be considered ‘the future’. The ‘future’ has been on the market for over 2 years now and has been overlooked by too many people to mention – but the future is definitely the Surface Pro and hybrid tablet computing in a world where we are demanding versatility, power, portability and all at a reasonable price. ‘Persistent perfection’ is what a lot of companies strive for. Many do not achieve it because being persistently perfect is not a terribly realistic business concept. But to me, the Surface Pro is persistently perfect. Each generation just keeps getting better and better. 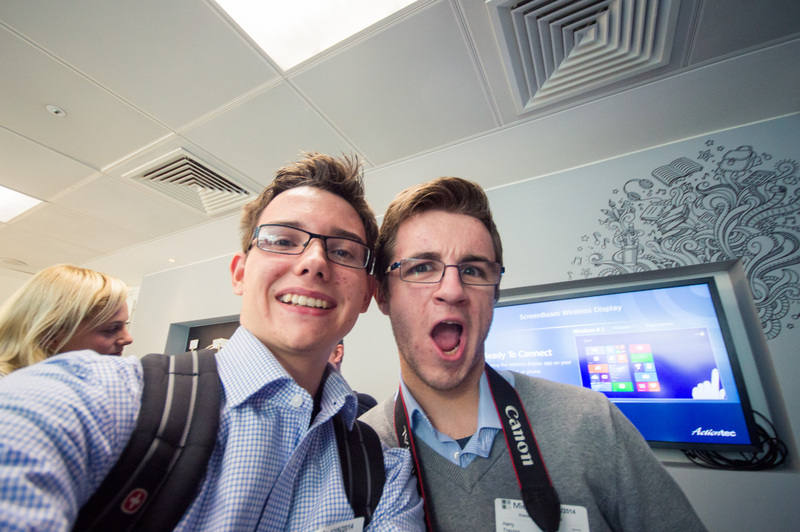 On Friday December 5th 2014 myself, Kevin Sait, Harry Traynor and Wymondham High Principal, Russell Boulton, headed down to London for the day to attend the Microsoft Innovative Educator launch event in Microsoft’s swish offices in Cardinal Place, Victoria, London. 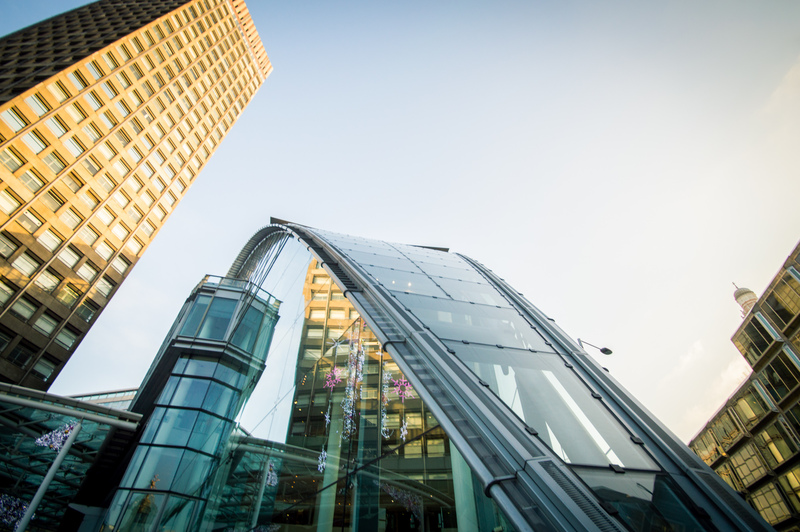 The exquisite Cardinal Place offices in Victoria, London, where the event was held. As with all O Team outings, it was an early start, many selfies were taken and a McDonald’s just off the M11 was eaten, but a great day was had by all four of us who found the event helpful and inspiring. The event itself began at 9.30 in the Microsoft Showcase Classroom with Steve Beswick’s (Head of Microsoft Education UK) presentation beginning at 10.00. To ensure that we could get down to London for the opening of the event we had to leave Wymondham by about 5.45, which was an early start! I was picked up from my door by Kevin at about 5.40 and we picked Harry and Russell up along the way. The original plan was to go on the train from Diss to London Liverpool Street, but in the end we decided it’d be easier to drive down to Epping and get a Central line Tube into London. We arrived at Epping Tube Station in Essex at about 8.30 and after being crammed onto several Central and District line Tubes and having run around Bank and Monument Tube Stations exhausting ourselves running up the stairs, we arrived at the Microsoft offices in Cardinal Place, Victoria, at around 9.00, leaving us half an hour before the event began. 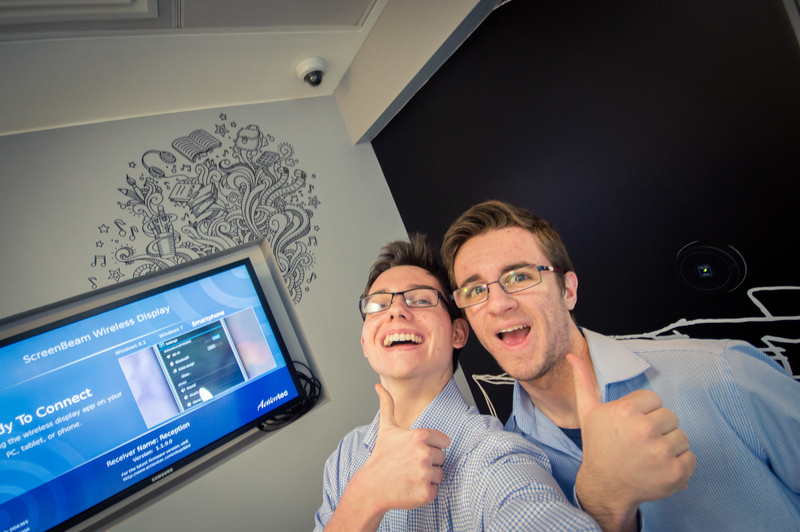 First selfie of the day, an ‘arrival selfie’ by Harry and Jason! 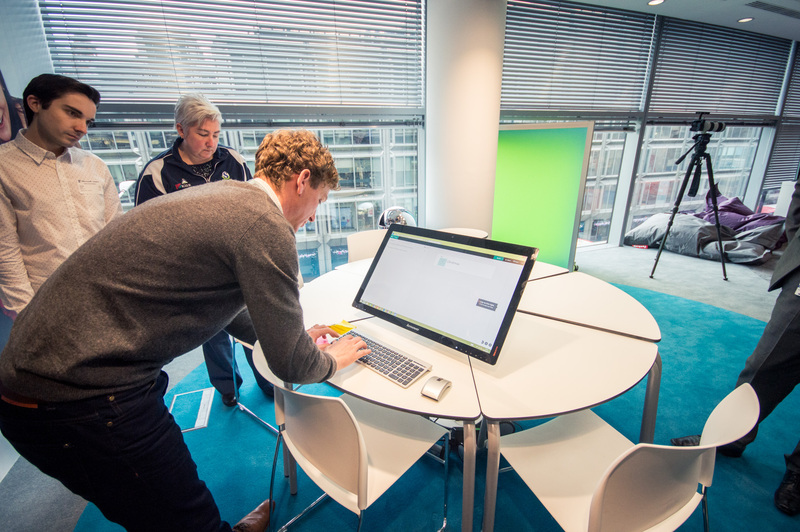 Microsoft employee Graham gave a good demonstration of Sway, showing off it’s touch-compatibility on a touch-enabled Lenovo desktop PC. After Steve’s presentation the group was split up into 6 and we each had a chat with a Microsoft employee about a piece of Microsoft technology. We had demonstrations of Office Mix which adds interactivity to PowerPoint presentations such as the ability to use videos and quizzes and Sway which is a web-based presentation tool that is still in beta at the moment but is looking rather groovy and got everybody’s attention, as well as the Bing Translator app which works really well for translating text using the camera on your Windows-based tablet or smartphone. Once these small presentations were over the group was then divided into two with the secondary and primary school teachers each receiving different presentations. This was when Mandeep Atwal, our link with Microsoft Education, took Harry and I to one side and told us a little more about the Student Ambassador Program that we both recently joined. 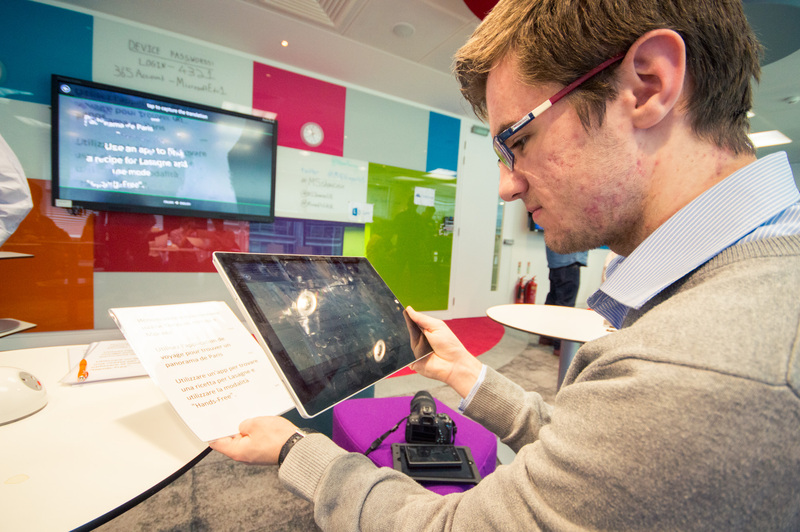 Here’s Harry suitably impressed by the Bing Translator app running on a Surface Pro 3! Mandeep explained how there was going to be a Microsoft Innovative Educator YouTube channel that would be managed by one of the Innovative Educators but asked if we could interview each of the educators at the launch event for the channel. She also told us about a possible trip to Microsoft’s HQ in Redmond, Seattle which may be taking place next year or 2016 and also spoke to Harry about presenting with the Surface Pro 3 team at the BETT Show in January 2015 which I will be attending on the Saturday – and she also informed me about how my name was ‘written all over BETT 2016’, which I’m really looking forward to presenting at! Harry and I spent the afternoon interviewing the Innovative Educators. These are teachers and IT managers from schools all across the UK who have implemented Microsoft technology into their classrooms. Although each interview only lasted around a minute, it was really inspiring talking to different people about how they want to use Office 365 in schools. I think one of the most inspiring Innovative Educators I spoke to was a lady who teaches in a Pupil Referral Unit. For those of who who don’t know, a Pupil Referral Unit is a school where children who cannot cope or behave in a mainstream school go. Typically education is very strict here and the students are supervised all day long. It was great hearing her say that thanks to Office 365 and tablets in the PRU, the students were able to choose how they worked and they could choose the correct tools for the job. Obviously she mentioned that they still have to monitor the students, but using technology allowed them to be a little more independent and creative in their work, which is often something that is omitted from an education in a PRU. Mandeep was impressed by the beginnings of Harry’s Yammer and Office 365 promotional video! Other Innovative Educators had only just started out rolling out the technology in their schools but had visions of the technology engaging children and replacing old technology such as interactive whiteboards and desktop computers. Others envisaged 100% of students owning a device, whether it be a smartphone, tablet, laptop or desktop and others are already well into the game and have successfully rolled out Office 365 and have been affiliated with Microsoft for several years now and had used technology to fully engage students in their lessons. A science teacher we interviewed told us that he had students who never did homework and were never attentive in lessons, but thanks to using technology in the classroom to teach the students about power generation using an online game where users can build their own cities and power stations and buy and sell electricity from one another, those students were now hooked and had been seen playing the game in school at break and lunch times! They were learning in their free time without even knowing it, and this is why technology is such a valuable asset in the world of education. We interviewed Innovative Educators from all kinds of different schools, from primary schools to further education colleges and all from all corners of the country, from Cornwall to Scotland to London and all! It was really interesting hearing what these teachers thought of technology in the classroom and also to learn how they have been deploying Office 365 and tablets. 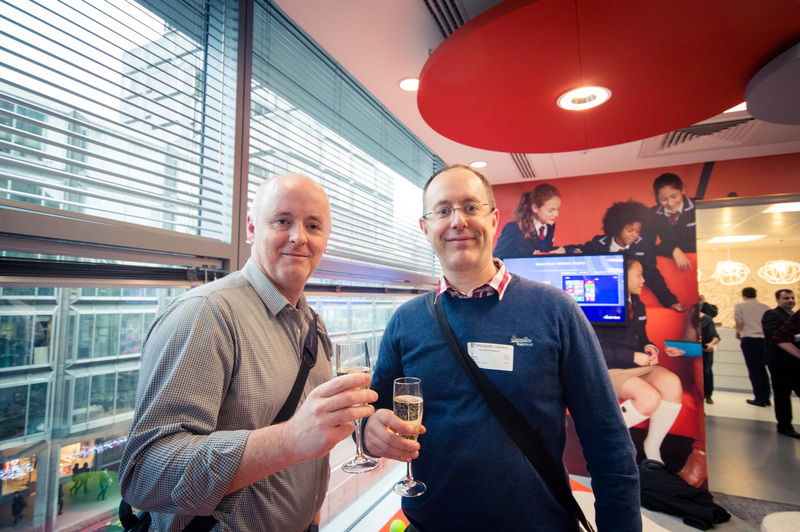 Kevin and Russell celebrate with a glass of champagne after having Innovative Educator and Showcase School awards. At the end of the event the Innovative Educators received their awards from Anthony and Steve and of course celebrated with a glass of champagne. The schools also received their Microsoft International Showcase School 2015 award which Russell Boulton proudly collected from Steve Beswick. After some talking to Microsoft employees about using technology in education, it was time to get back on the Tube and go home after a long day. Victoria Tube Station at around 16.00 on a Friday evening in December is not really the place you want to be if you’re claustrophobic and nor is a District line Tube train but the day did of course end with a ‘Tube selfie’ of me and Kevin taken on his Nokia whilst on a District line train travelling home. 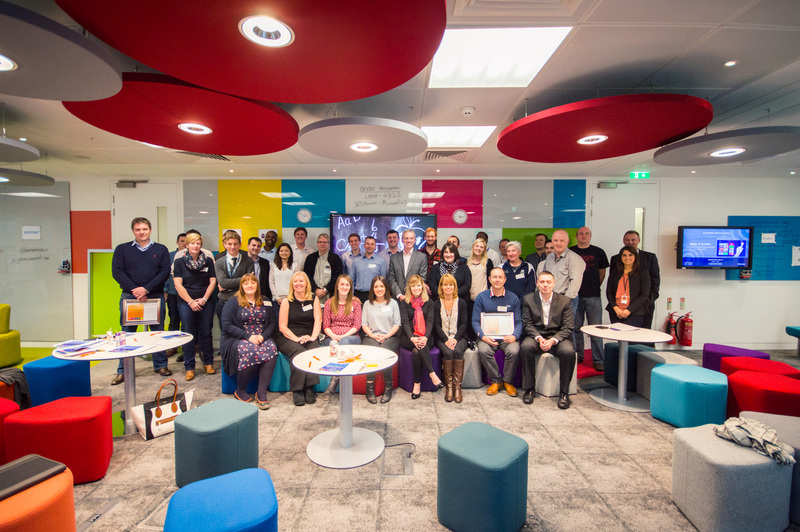 All of the Innovative Educators and Headteachers in the Microsoft Showcase Classroom at the event. 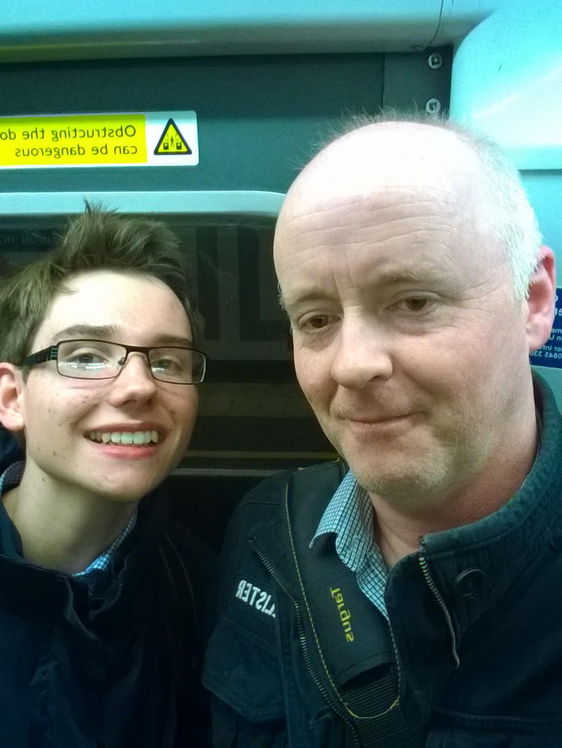 Kevin and Jason take a selfie on a District line tube on the way home. When is an O Team outing not an O Team outing? When there isn’t a McDonald’s! We stopped off a McDonald’s just outside Epping on the way home and each had a delicious Winter Warmer burger. We discovered that our Principal, Russell Boulton, knew rather a lot about McDonald’s and even introduced us to the innovative game of ‘the chip challenge’. To round the day off we played with some of the technology in the Toyota RAV 4 hire care that we were using for the day. We paired Harry’s phone up to the Bluetooth and streamed Christmas songs from Spotify that we listened to going up the M11 back to Norfolk, but thank goodness 3G reception in Thetford Forest proved to be rubbish because it meant we (unfortunately) couldn’t listen to the Christmas cats ‘singing’, or should I say ‘meowing’, Jingle Bells. To conclude, we had a great day and felt it was a really helpful, inspiring and exciting event to go to. We are looking forward to returning to Microsoft again soon, hopefully in Seattle and the next trip we are preparing for is the BETT Show 2015 in the ExCel Arena in London. The photo that sums up the day! Harry and Jason give the thumbs up after interviewing 30 Innovative Educators! We also noticed that the majority of students on Windows 7 were not interested in working there way through the All Programs menu to find the application they want to work on, but instead they tended to Search for it. Windows 8.1 federated Search facility allows students to quickly find application or documents and get started into a lesson a lot quicker than before. We upgraded the whole site using System Centre Configuration Manager which deployed all the machines within a few days. The great news was all of our curriculum based applications would run quite happily on Windows 8.1 (testing is highly recommended!). 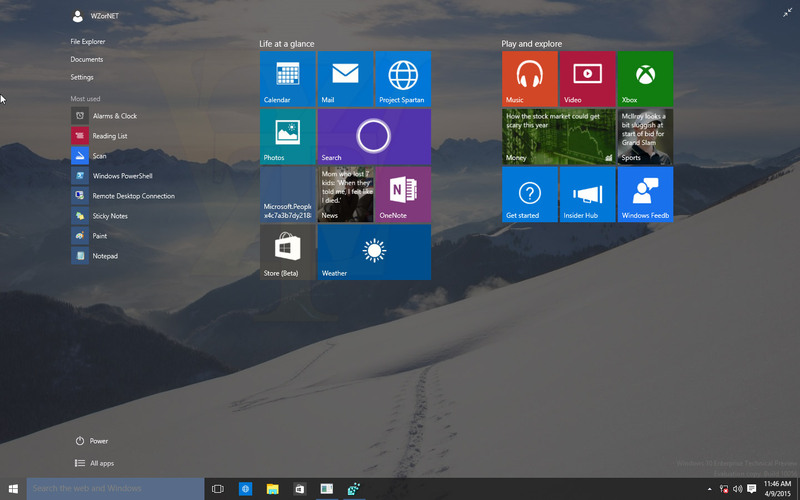 Added to this with our Microsoft Dreamspark store, students could now download Windows 8.1 at home as well. Logon times have also improved by approximately 30 % this means students can get into a lesson more quickly. As for the future we we are already looking at moving some of the in-house network actions into the cloud using the Microsoft Live ID. We are planning to sync user environments directly to the desktop (teachers first!) using Live ID, and the enlarging that to allow students to sync there ‘school’ environments to any other Windows 8.1 device they log onto. The initial tests are very encouraging. Students have started developing Apps using Project Siena ( Windows Store App for free) as an initial step into Computer Science, though not strictly computer programming, it does teach the logical thought process into designing apps. The second reason is the school has a desire to push technology forward. For so long we have seen technology move on around schools, with students and there smartphones, new devices at home, new devices in the workplace, this is matched with a distinct possibility that a school may be running an older versions of Windows or Microsoft Office. As educators we are enabling students hopefully with the correct skills in the job marketplace in may be 5 to 10 years time, so I believe the school has almost a moral obligation to give students great experiences using the latest software. Also the next generation of secondary school pupils will be on us soon who have been brought up with the tablets, touch devices and smartphones, to those pupils technology in the classroom will be even more of an expectation. Did you know 2.2 million tablet users in the UK are between 3-11 ? How does the education system react to this ? Probably with teachers with books instructing students with traditional teaching methods unless we make moves forward by matching education technology with the world around us. I believe Windows 8.1 to be a truly ‘creative operating system’ allowing users to shape and develop their own learning, and it may just be the first step on the way to catering for the next generation of learners coming to our schools.